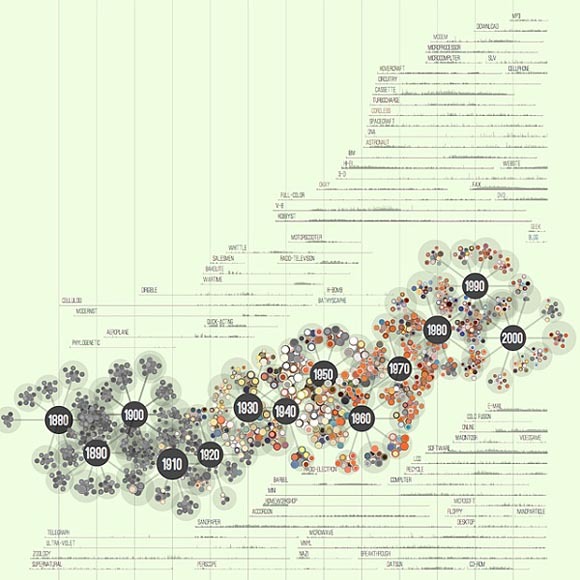 Data artist Jer Thorp visualized the Popular Science archive. Screenshot of the Popular Science archive visualization (click to enlarge). Picking out interesting words from all of the available choices (pretty much the entire dictionary) was a tricky part of the process. I built a custom tool in Processing that pre-visualized the frequency plots of each word so that I could go through many, many possibilities and identify the ones that would be interesting to include in the final graphic. This is a really common approach for me to take — building small tools during the process of a project that help me solve specific problems. For this visualization, I actually ended up writing 4 tools in Processing — only one of which contributed visually to the final result. You can see more of the images of this visualization in Thorp’s Flickr account.